•To create an innovative curriculum that is creative, engaging and purposeful for all children set in a real life context of Christ. •To ignite a lifelong thirst for learning. Jesus said, "Come, follow me and live your life the way God wants you to." We have an identified six core values: compassion, thankfulness, respect, responsibility, peace, forgiveness and encompassing all of these is the value, koinonia. These values are based on the Gospel of Jesus Christ and our point of reference is the Bible. Each half term the whole school will focus on one particular value to explore at a deeper level. 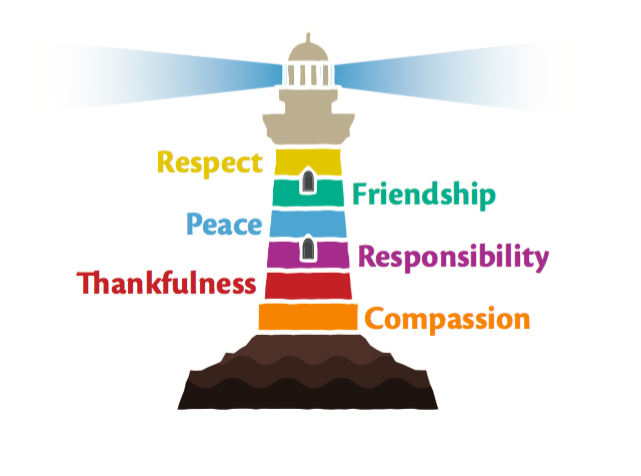 We have also adopted a lighthouse as an emblem, each colour on our lighthouse represents a different value. Our Worship Committee made this video to show how we can show compassion to one another. They then shared it with the whole school as they led our collective worship.